Ryders Eyewear Photochromic Lens | Camo Frame - Used and still in great shape. I just don't just them $99 RRP. Priced to sell fast. Brand new, never worn, and they come with a hard case and three lenses. Fiancee ordered them but ended up changing her mind on the style. Used but good condition. Clear lens is pretty much new and scratch free. Comes with facbric bag. Buyer pays shipping and Paypal fees. Please let me know your zip code so I can look up shipping. 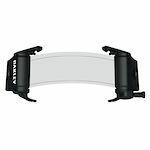 Oakley Airbrake MX Roll off system. Plastic cartridges not included. Basically free to anyone that wants this. Just have to pay $5 and shipping. Paypal or COD. Nike Vaporwing Elite R Evo sunglasses in matte black with case. Only worn a handful of times, no scratches, excellent condition. Price includes shipping to the lower 48, otherwise buyer pays shipping. Nike Tailwind, good condition. or a six pack of nice beer and they could be yours! Like new, Oakley Windjacket sunglasses. These are awesome glasses but don't fit my head like my Jawbreakers do. 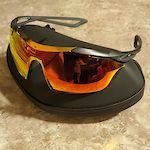 Incredible field of vision and wind protection makes these good for cycling and skiing. Matte black frame with Prizm green lens. 100% Speedcraft sl glasses. Neon color comes with the red mirrored lens. Also including the clear lens and cloth glasses bag. Fit great and stay on your face very well.